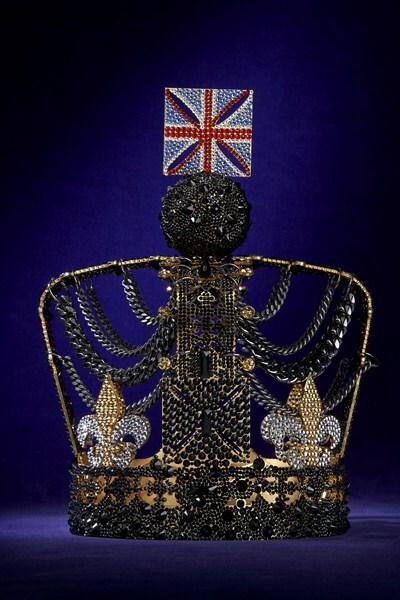 Harrods celebrates the Queens Diamond Jubilee – with designer crowns! London is currently a proud sea of red, white and blue thanks to the bunting, flags and face painted children celebrating the Diamond Jubilee. 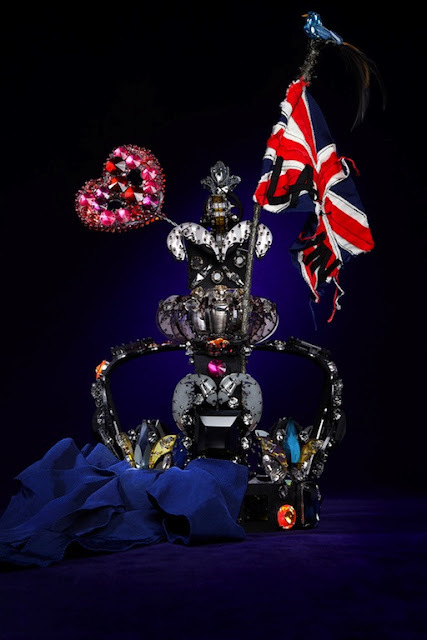 The atmosphere is electric and London is merrily embracing all of its British treasures. 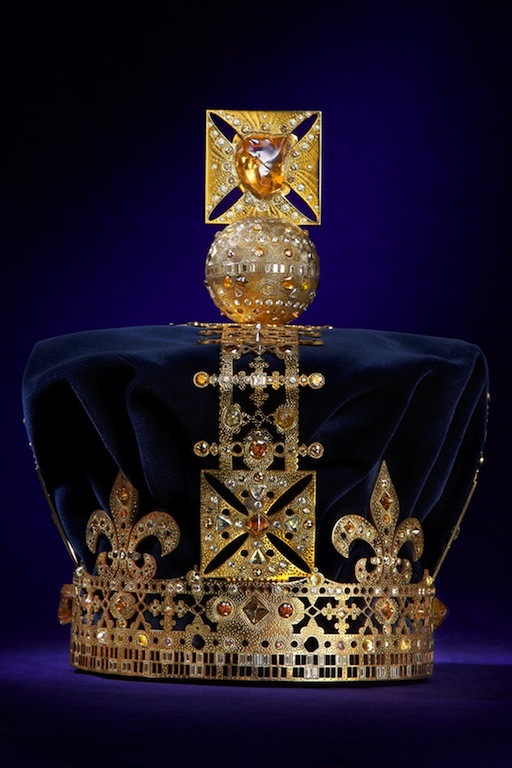 And what better treasure then the Queens crown itself? 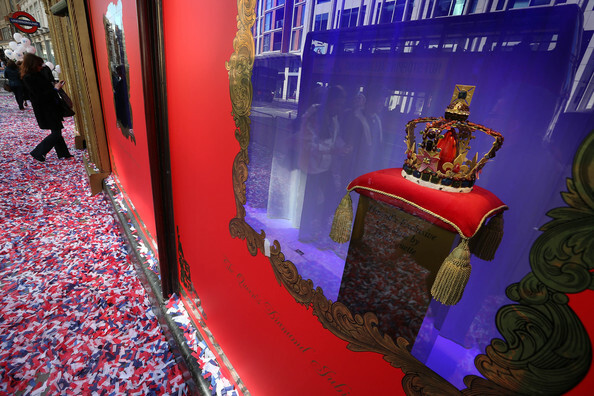 Luxury department store Harrods has filled its windows with 31 dazzling crowns – all individually designed and created by the finest in fashion, cuisine, jewellery and beauty. Yesterday I took a visit to the world famous store to marvel through the glass at these unique creations. They are definitely fit for a Queen, and any fashionista for that matter! I’m already feeling very inspired to design my own crown, one which would represent my personal taste alongside my love for England. But I have a feeling that my wavy-cut scissors, PVA glue and Christmas coloured glitter may not be adequate to make the finished item. 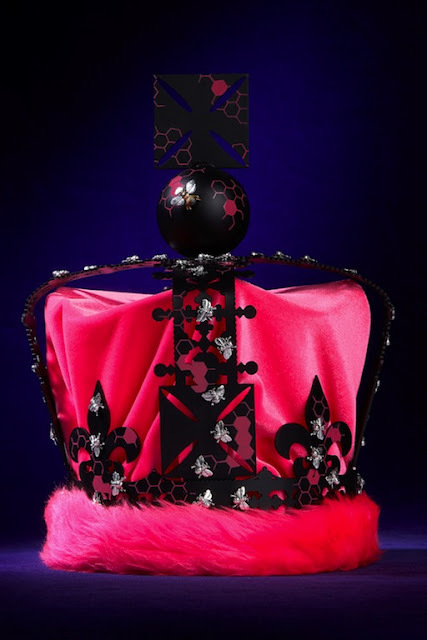 Try scrolling down and guessing the crowns for yourself, I’ll leave the designers name underneath the image. It’s fascinating! 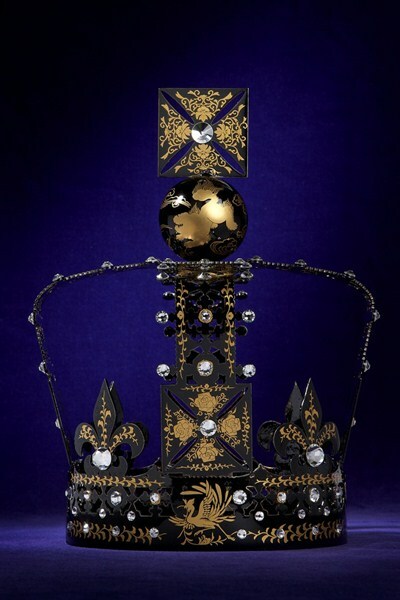 The “Carosello” crown was designed by Giovanni Alessi who wanted to capture the pride and spirit of the British nation. 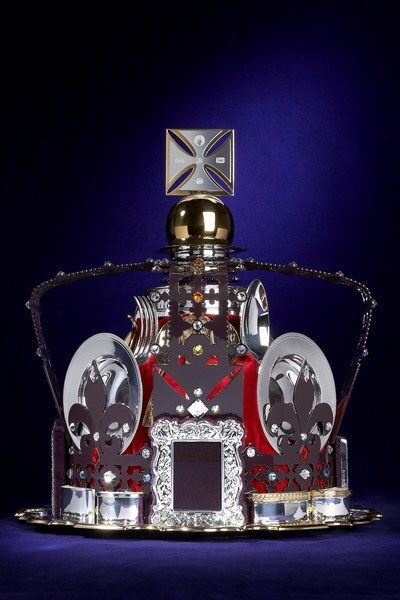 The italian company that is famous for its luxury joyful kitchen utensils used stainless steel to create the crown. 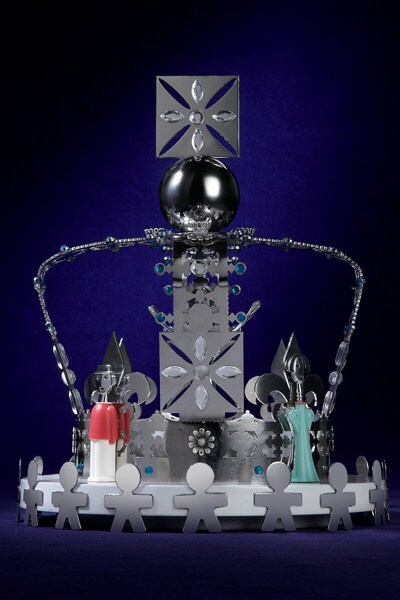 Carrs uses its famous silverware cutlery in this fit for a picnic crown. 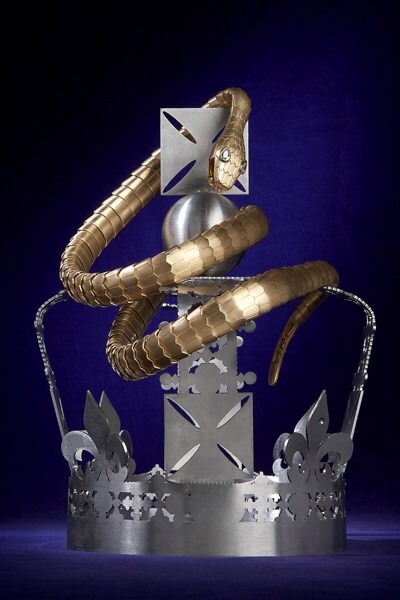 The crowns statement gold and silver colouring reflects both Bvlgaris prestigious jewellery and a ceremonial old England. The snake is an interesting yet menacing choice, made even more remarkable by the fact another designer also chose this creature. 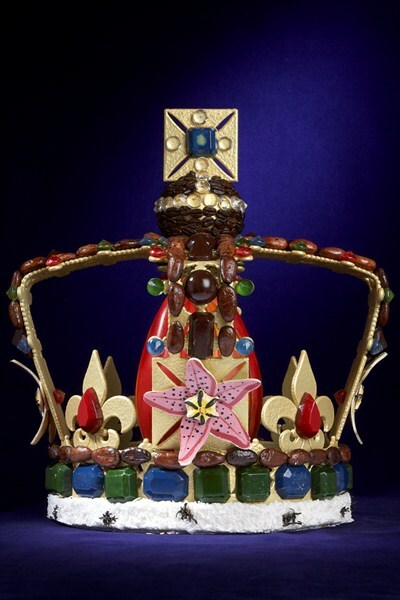 This poetic crown is covered in intricate butterflies and flowers made of gemstones. It resembles the beautiful historical gardens in England. Being world famous for their diamonds, I can imagine the designers at Da Beers were ecstatic to be asked to create their own version of the imperial state crown. And of course, diamonds were very much on the agenda. 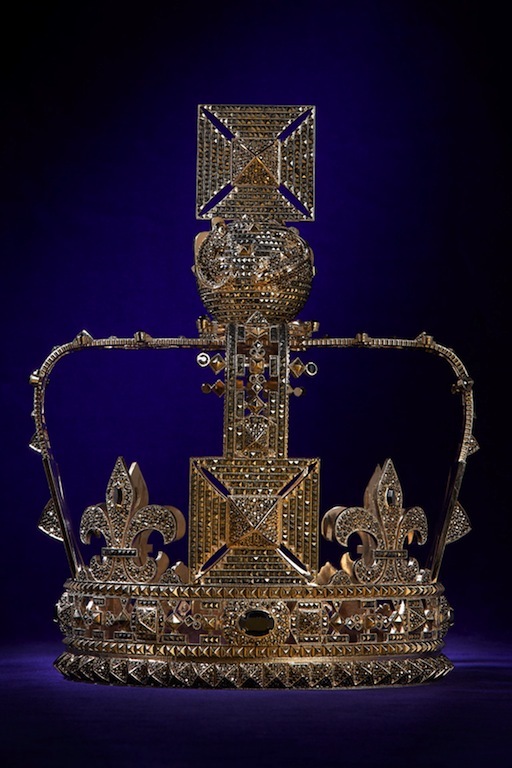 The crown includes 974 diamonds of which 797 are polished at the rest are rough. 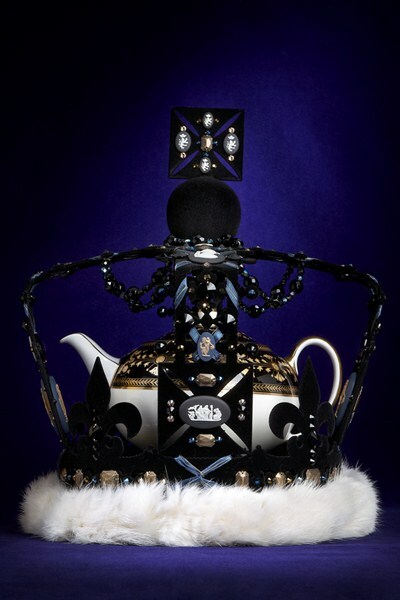 When it comes to luxury Clive Christian is usually the one wearing the crown. 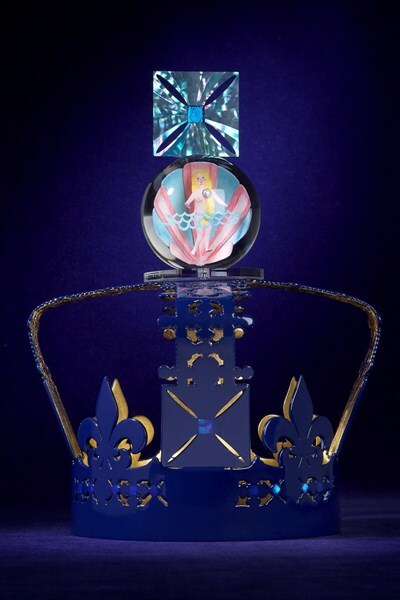 The interior designer even has his own perfume which is the most expensive in the world! 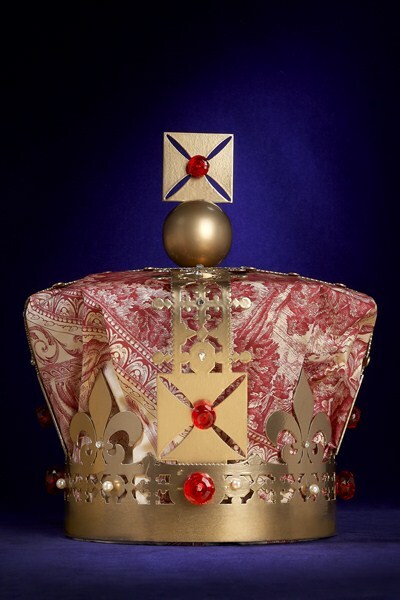 Here he’s gone for his trademark ornate decor with a decorative design in red, white and gold. This vibrant and modern take on the Imperial State Crown is made fun and joyful by the gem encrusted pink heart at the top opposite a rock ‘n’ roll burnt Union Jack flag. 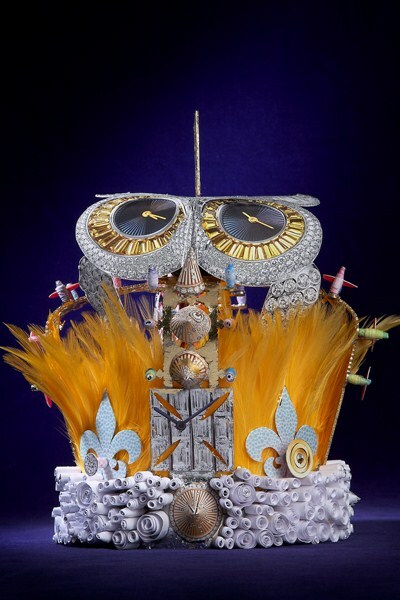 The italian fashion house displayed its skilled craftsmanship and passion for archaic heritage. 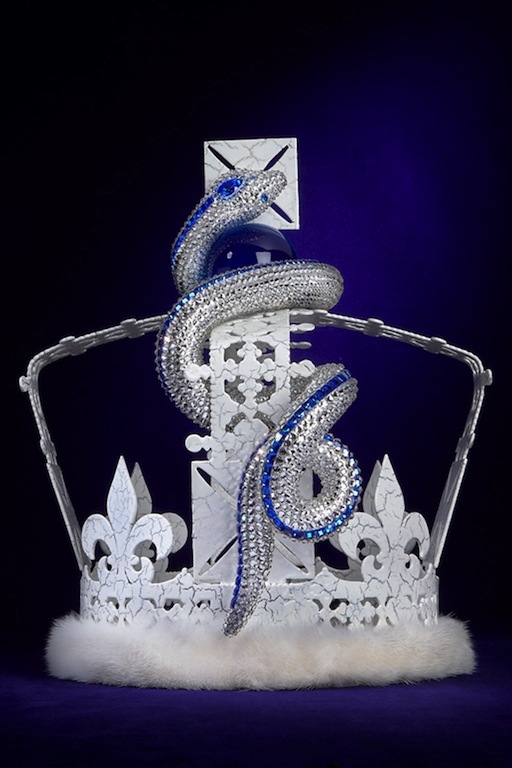 The french jewellery house is known for its diamond encrusted animal creations and said the snake symbolises protection and infinity. Being a fan of monochrome this crown is one of my personal favourites. 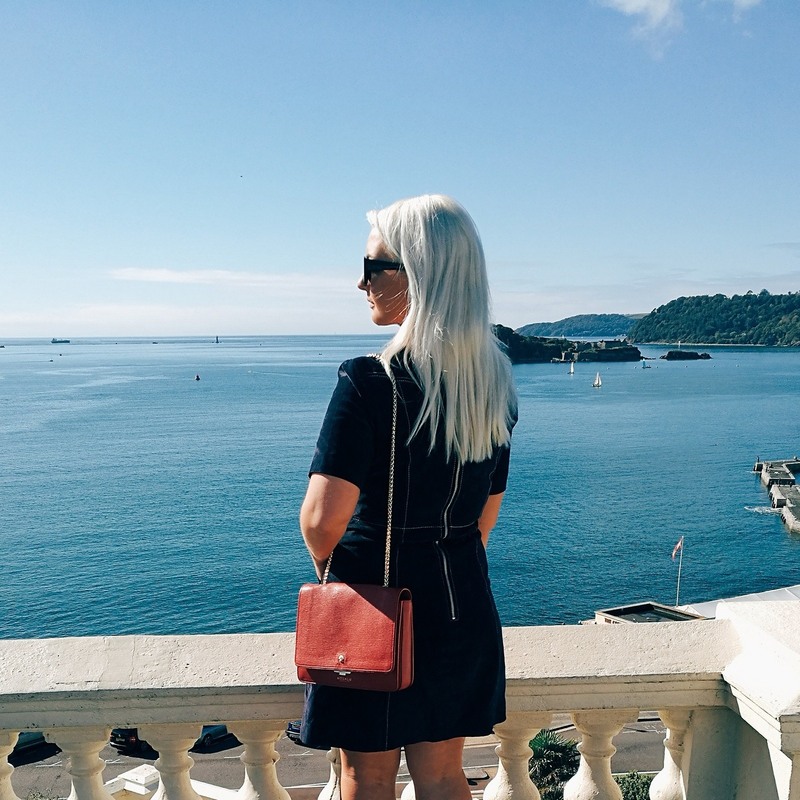 Its chic, understated and undeniably classic. The iconic signature cream and black colours demonstrates the elegance of Jo Malone. Going for a 60’s vibe Paul Smith covered this crown in corgis, miniature figures and vintage stamps. 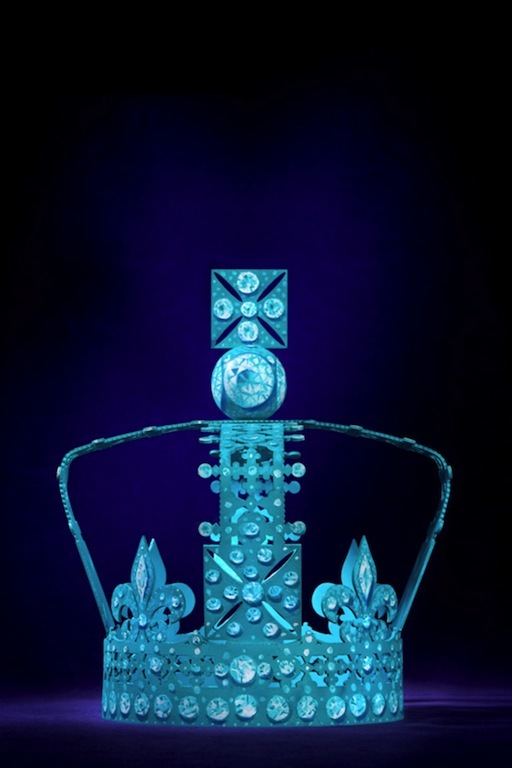 Tiffany went for their iconic blue and embellished it with crystals. 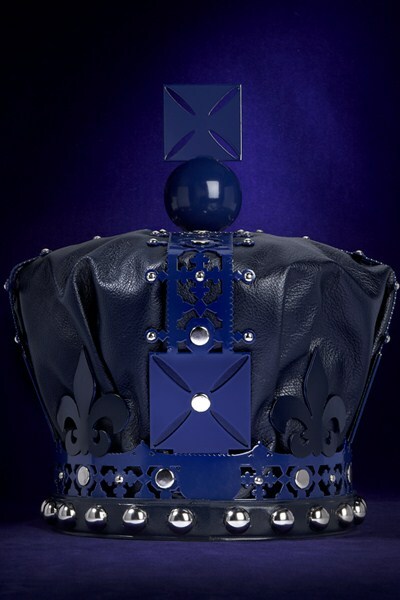 Luxury luggage manufactures Globetrotter have created a darker, more mysterious version of the crown, with dark blues and silver embellishments. 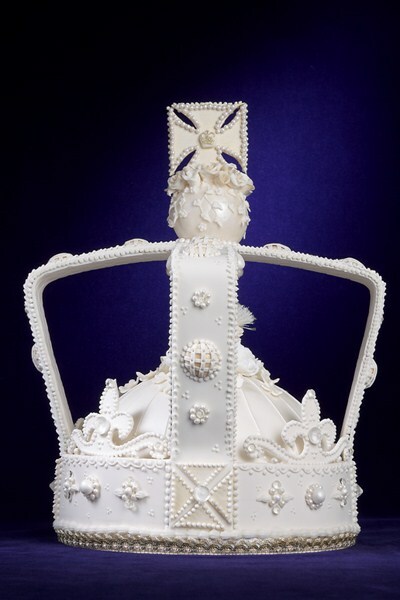 Cairns designed the royal wedding cake for Prince William and Kate Middleton in 2011 so it was most fitting that she was asked to create a crown in honour of the Queen. This delectable creation is made up of fruit cake and decorated with sugar. Italian shoe designer Salvatore Ferragimo created this mesmerising piece. 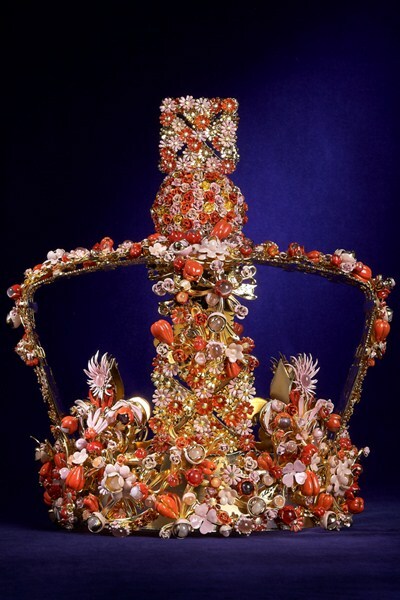 The tiny roses and pearls against gold and coral look exquisite and this is certainly one of the most imaginatively detailed crowns. Crushed pink satin and ice-cream coloured gem stones easily makes this my favourite. 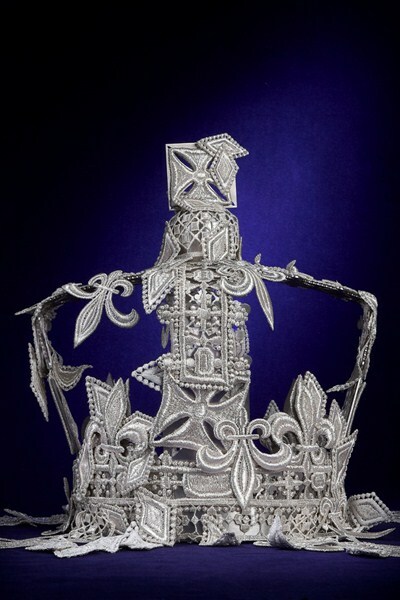 Delicate lace and intricate references to heritage this crown certainly shows an interesting interpretation. Its craftsmanship mirrors fine English taperstry but the falling diamonds and broken pieces suggests a deeper tone. 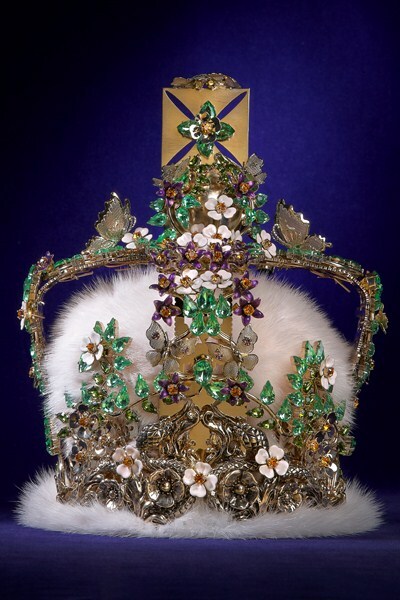 This was my favourite crown. Although I have to admit I’m slightly biased because Dom Perignon is my must-be-in-my-hand accessory when I’m in London. I owe many wonderful nights to this company! 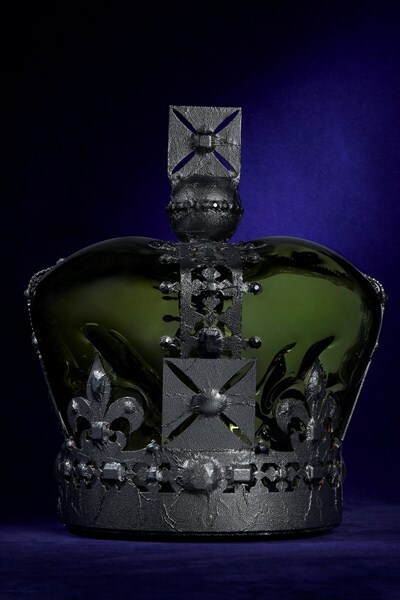 The hand blown glass was made from, of course, one of their bottles and the finished foil is iconic of Dom Perignon. 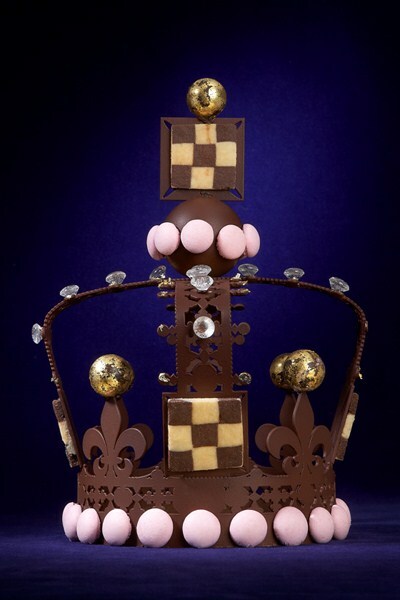 The british fine chocolatier created this toothsome crown inspired by the common wealth. Using a delicious combination of white chocolate and edible gold. The cocoa beans and coffee represent the chocolate that is made in other common wealth countries. The best of English pottery mixed with one of the most iconic English items; a teapot. The award winning british patissier and chocolatier has covered his delightful edible masterpiece with little macaroons, biscuits, bon bons and delectable chocolate truffles. 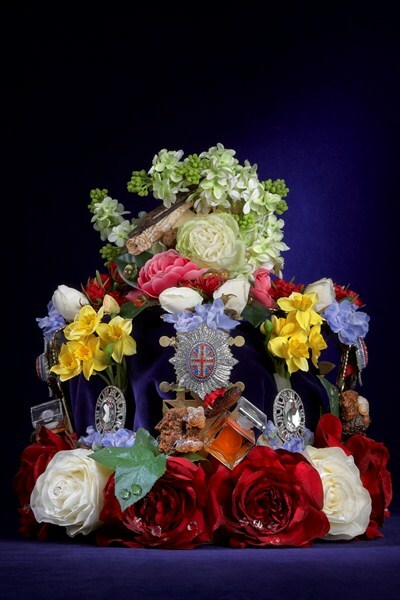 This is definitely one of my favourite crowns; pure indulgence! 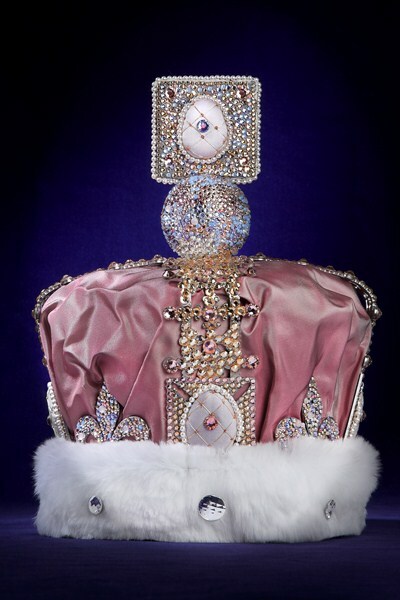 Mikimoto is known for its pearls, so designing the crown based on the ocean seems like a perfect tribute. 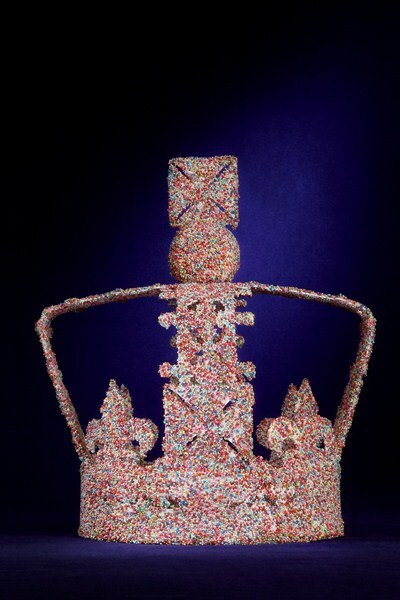 Designed to look like an English cake this delightful crown is covered in hundreds and thousands. 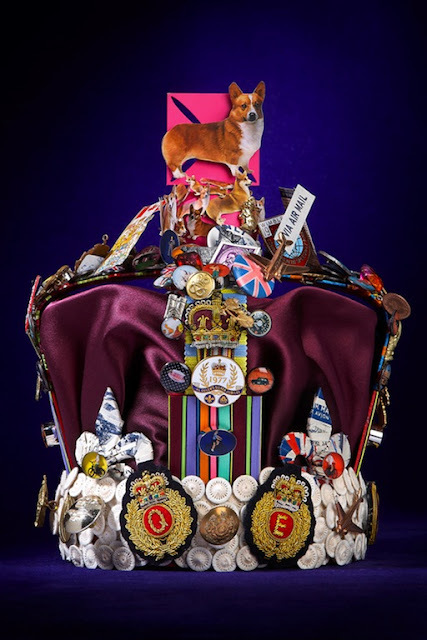 This certainly adds a child like spirit to the display of crowns, and reminds me of all the jubilee cupcakes make my children across the country. 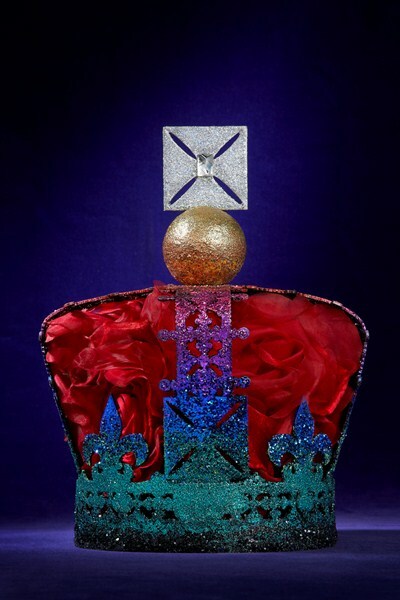 “My crown symbolises the most sacred part of the Coronation Ceremony – the moment Her Majesty The Queen was anointed with Holy Anointing Oil,” explains the British perfumer. 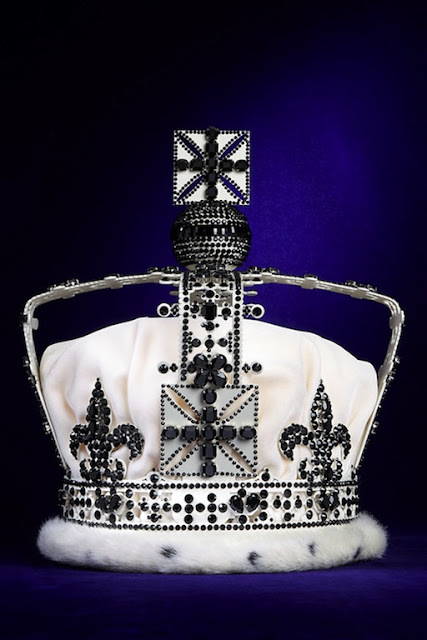 Beauty experts went for a more traditional crown embellished with crystals. Previous Post My 21st birthday!